The Holy Prophet Elisha (Elisei) lived in the IX Century before the Birth of Christ, and was a native of the village of Abelmaum, near Jordan. By the command of the Lord he was called to prophetic service by the holy Prophet of God Eliah (Ilias, Elijah) (Comm. 20 July). When it became time for the holy Prophet Eliah to be taken up to Heaven, he said to Elisha: "Ask, what shalt I do for thee, before that I be taken from thee". Elisha boldly asked for a double portion of the grace of God: "The Spirit, which be in thee, let it be upon me twofold". The Prophet Eliah said: "Thou dost ask the difficult; if thou seest as I be taken from thee, then so shalt it be for thee, but if thou seest not, it wilt not be" (4  Kings 2: 12). And when they went along the way and conversed, there appeared a fiery chariot and horses and parted them both. Elisha cried out: "My father, my father, the chariot of Israel and its horse!" (4  Kings 2: 12). Picking up the cloak (mantle) of his teacher which fell from the sky, Elisha received the power and prophetic gift of Eliah. He spent more than 65 years in prophetic service, under six Israelite kings (from Ahab to Joash). "And in those days he trembled not before the prince, and no one could overcome him" (Sirach 48: 13 ["Sirach" in the canon of Old Testament books is found in Catholic but not Protestant English translations of the Bible, rendered as "Ecclesiasticus"]). The holy prophet worked numerous miracles. He divided the waters of the Jordan, having smitten it with the mantle of the Prophet Eliah; he made fit for drinking the waters of a Jericho spring; by an abundant bringing forth of water by his prayer he saved the armies of the kings of Israel and Judah that stood in an arid wilderness; he delivered a poor widow from death by starvation through a miraculous increase of oil in a vessel. The Shunamite woman showing hospitality to the prophet was gladdened by the birth of a son through his prayer, and when the child died, he was raised back to life by the prophet. The Syrian military-commander Namaan was healed from leprosy but the servant of the prophet, Gehazi, was afflicted since he disobeyed the prophet and on the sly took money from Namaan. Elisha predicted to the Israelite king Joash the victory over his enemies and by the power of his prayer worked many other miracles (4  Kings 3-13). The holy Prophet Elisha died in old age at Samaria. "And in life he worked miracles, and at death astounding was his deed" (Sir. 48: 15). A year after his death, a corpse was thrown into the cave wherein lay his remains, and came alive by a mere touch to his bones. The Prophet Elisha, just like his teacher the Prophet Eliah, left behind them no books, since their prophetic preaching was but oral. Jesus, son of Sirach, inscribed eulogistic praise to both the great prophets (Sir. 48: 1-15). Saint John Damascene compiled a canon in honour of the Prophet Elisha, and at Constantinople a church was built in his name. 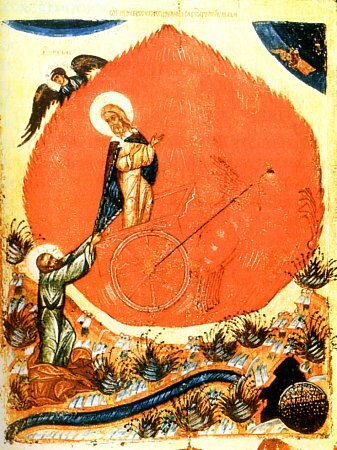 Julian the Apostate (361-363) gave orders to burn the relics of the Prophet Elisha, Abdia (Obadiah) and John the Forerunner, but the remains of the holy relics were preserved by believers, and part of them were transferred to Alexandria.